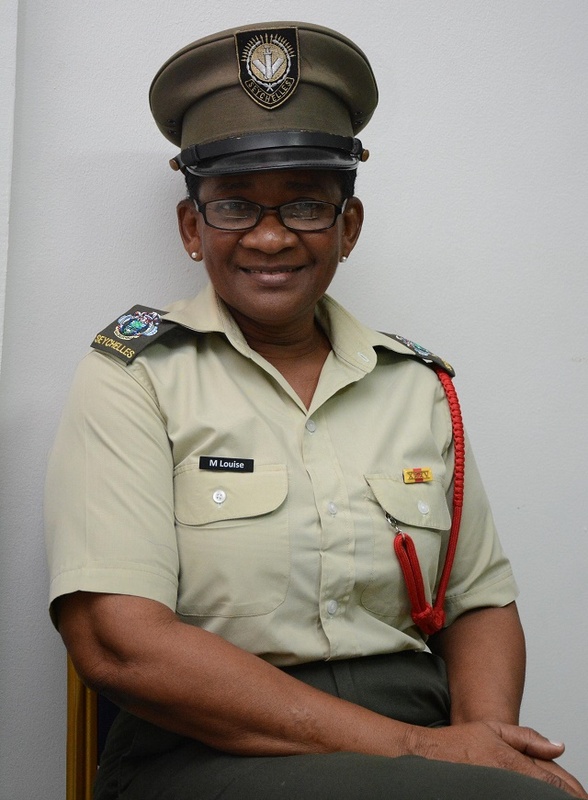 (Seychelles News Agency) - Margaret Louise, a 37-year military veteran, earned a promotion in rank from captain to major in the Seychelles People’s Defence Forces (SPDF) earlier this month. Louise, a resident of Rochon, in the central district of Mont Fleuri, joined the military in 1979 at the age of 21. SNA met with Major Louise, 58, at the SPDF Headquarters at Bel Eau where she works in the administration section. The mother of four -- two boys and two girls -- talked at length about her life as a military woman. SNA: How do you feel about your promotion from Captain to Major? ML: It is a big deal for someone to reach this level, especially as a woman. Also, when someone, receives such promotions you know that you are being observed and evaluated and I feel that I still have a lot more to give, to contribute towards the advancement of the organisation and the society. At this specific point in my life, I can confidently say that I have no regrets for my chosen profession. I have learned, grown and gained unimaginable experiences. I am now an accomplished woman. SNA: It has been 37 years and you have just received the promotion this year. Do you feel that is too long compared to others? ML: No, because the SPDF is an organisation that gives everyone an equal chance to deliver and prosper. All opportunities are there, so we are the ones who should grab those chances, take all the opportunities, contribute, work hard and prove our worth. I have never personally encountered any acts of preferences in the force. Today I stand as living proof of this, being the highest ranking senior female officer in the force proudly standing alongside my male counterparts. SNA: What motivated you join the military and was this your first job? ML: I joined the military soon after it was formed in 1979. Around that time the Seychelles Militia was formed and aimed at providing security assistance. Before joining the military I was a member of the Militia. 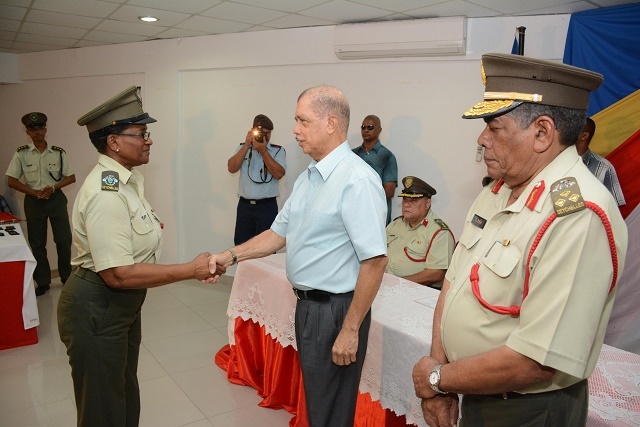 Then there came the call for women army officers, I decided to quit the militia to join the first group of women who were to train as Seychelles People’s Defence Forces women soldiers. SNA: How do you feel working in a male dominated environment? ML: Honestly, I have never felt the difference. I have always felt ok, comfortable and did what had to be done. Regarding training, we have always trained together and I have never felt like I did not belong. I have never felt that I was being put on the side or being discriminated upon. I got help when the going got tough just like any member of my team. I did not have to struggle to get accepted. SNA: What made you stay in the military for such a long time? ML: The minute I decided to take this path, I came in happy and determined. Firstly to be able to do this job you have to possess an excellent sense of discipline, a lot of patience and loyalty, self-determination. You have to know exactly what you want and what you desire to be. I also enjoy serving people and working with them. So these are the things that have kept me going until now. The military is not just any other job. When someone decides to join it is to defend his/her country as well and I wanted to bring in my contribution as a woman in this institution to serve my country and others. SNA: What has been your most challenging moment? ML: The challenges I’ve had to face have mainly been related to life’s issues, just like simply being a mother, a woman. This in itself is a challenge for a military person. You have to leave your children and your family behind. You do not have time to look after and take care of them. But I have been able to surmount these challenges because I have always received a lot of help and support from my family especially when I’ve had to be absent from home for long periods of time. I am thankful to all of them. SNA: Which has been the most rewarding? ML: My promotion of course. Each time I got a promotion during my career made me feel really good. But this last one from captain to major is the culmination of my life’s worth so far and I feel proud to have achieved this much. This is no doubt the most rewarding thing for anyone in the military be it a man or a woman because it proves that all the efforts given over the years, your perseverance, all your hard work, at the end of the day you have been recognised, compensated for all of them. SNA: Tell us about the physical side of career. ML: When you join the military there is no distinction whether you are a man or a woman. Everyone follows the same strict routine, the same rigid training programmes and abide by the same rules. SNA: What would you tell women considering a military career? ML: I will say to the young women who wish to take up a military career that yes there is a place for you. The military is the place where you come and decide what you want to do and become what you want to. SNA: What would you tell parents who are concerned about their children taking up a military career? ML: They should not be afraid. In the military, we do not only hold and use guns. There are many other things attached to a soldier’s life, the chance for learning, training and personal development. The military offers a lot of opportunities. ... There is the chance to travel, see the world, the chance for personal and professional advancement. The SPDF is an organisation that upholds and practices strict discipline. ... I would encourage the youth to join, women who want to join, the opportunity is there, join us and make full use of these opportunities. Editor's note: Some questions have been re-ordered for topical considerations. Some answers have been shortened for space considerations.